Besides choosing a bull bar that’ll do the job, there is a certain amount of personal opinion on materials (alloy or steel), general type (hoop or post), aesthetics (do you like its looks or not), plus fit (does or doesn’t) and finish (polished, colour coded or plain ol’ black) when choosing the best bar for you and your 4x4. While I’ve had…Ummm… lost count of how many different bull bars on my various 4x4’s over the years, I’ve gotta say that the minute I laid eyes on the new Opposite Lock 63mm diameter steel winch bar, combined with side rails and steps, I figured that it was the best looking bar I’d seen on a 70 Series Cruiser. It features that larger diameter tubing, compared to most at about 50mm, giving it a much-needed macho appearance, plus fits the lines of the 70 Series perfectly. A point I always look for from the driver’s seat is that I should be able to just see the extremities of the bar work. This allows for perfect placement of your 4x4 while picking your way through tree lined tracks, negotiating rocky outcrops as well as for easier reverse parking without nudging other vehicles. This OL bar has been manufactured for a perfect fit and provides perfect visibility without hindering forward view. In this day and age of most wanting to fit the largest diameter driving light they can get their hands on, having a bar with maximum vertical space is an essential consideration. Not that I have lights large enough, but the gap in the Cruiser bar is about 29cm high with no horizontal bars getting in the way. Fitting of driving lights is an easy affair via easy hand and spanner access within the main cross channel. This same access slot also makes for easy operation of electric winch clutch lever operation. I fitted an 11,000lb RUNVA winch (more on that soon) which fitted perfectly within the Opposite Lock channel. I opted for optional halogen fog lights, because… hmmm, not sure why as I’ve never had them before, so I’ll have to report back later as to how well they work in fog. Flicking them on at night time via the separate light switch returns an extremely wide and low beam of light. The LED turn indicators seem a little out of place visually – a high tech rectangular light next to old school round halogen fogs, but do the job of on, off, on, off… Being LED they did upset the timing of the blink to double time, so I’ve had to install a blinker resistor to slow things down. As you would expect from a major 4x4 manufacturer and retailer, Opposite Lock’s bar is ADR compliant and air bag compatible – a major consideration when your bar shopping. As extras, I’ve ticked the boxes for side rails and side steps, which also continue the larger 63mm diameter theme; the rails should help protect the panel work during 4x4 work and the steps replace the ridiculously weak standard alloy units. Not that I’ve tested them yet, but I’m presuming the side steps will be strong enough to use a Hi Lift Jack on. Having the slightly longer side step also helps passengers in and out of the extra door on the passenger’s side – this is a 3 door Troopy remember! While fitting the side steps, the Opposite Lock fitters advised the standard exhaust system would have to be modified so as not to foul on the fitting brackets. This was done temporarily and I’ll be sorting an aftermarket replacement exhaust soon. The top loop of the OL bar features three slotted antenna tabs (two on the passengers and one on the driver’s side). Not that I need three antennae’s, but that does allow for sand flags to be easily affixed, plus being slotted all wiring can be left intact during installation as well as if they are ever removed from the bar – a much better option than just having a hole. While I haven’t mounted my driving lights, UHF antenna or flags to the Troopy yet, I know it’ll be a quick and easy job and no, I’ll not be buying larger diameter lights just to fill the void, the 208mm (8.2 inch) diameter FYRLYT halogen lights that were removed from the 100 Series will be gracing the Troopies new bar. They are simply the best lights I’ve driven with and unless something better comes along, I’ll stick with them. One consideration to the Opposite Lock design is the lack of built in recovery points. Obviously there are many aftermarket options that can be added directly to the chassis, but it would have been nice to have them included as standard. 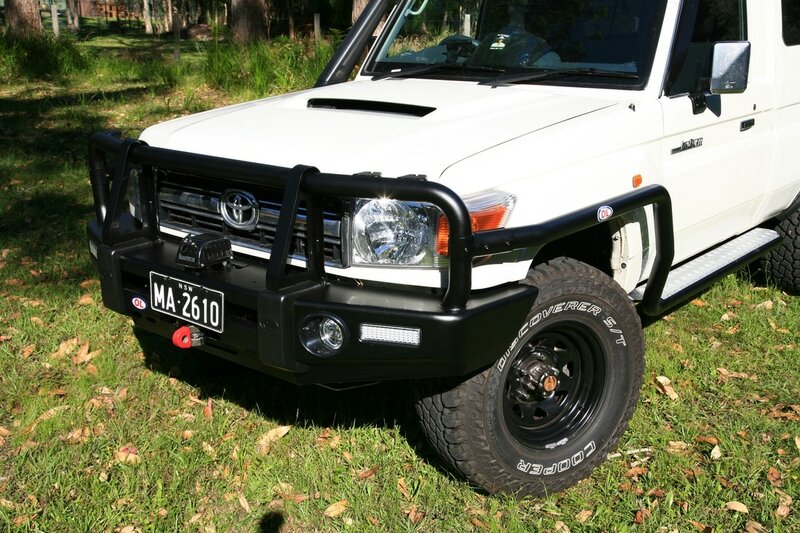 All up, I reckon this steel, large diameter, post-style bull bar sets the hairy chested 70 Series range off perfectly and is the ideal mounting point to fit electric winches, driving lights, antennae’s, flags and even a beaut posi’ to sit on, contemplate life on the road and watch sunsets from.